Remedica expresses its sincere condolences to the families of the victims of the fires in Greece. Within a short time, the company employees of Remedica offered a large number of essentials as well as a cash sum of € 2,500. Additionally, the company’s management provided € 20,000 through the Hope for Children Foundation in order to rebuild what was lost in the Attica fire-struck areas. 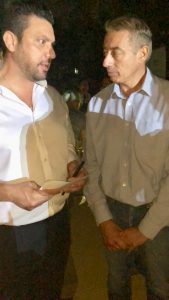 The Managing Director of Remedica, Dr Michael Neoptolemou offered the money to the Commissioner of Volunteerism and Non-Governmental Organizations, Mr Giannis Giannakis. The contribution was made during a concert given by the famous singers Antonis Remos and Anna Vissi which took place at the Nicosia Municipal Garden next to the House of Representatives.